There’s something about a red Smeg Fab refrigerator. See? 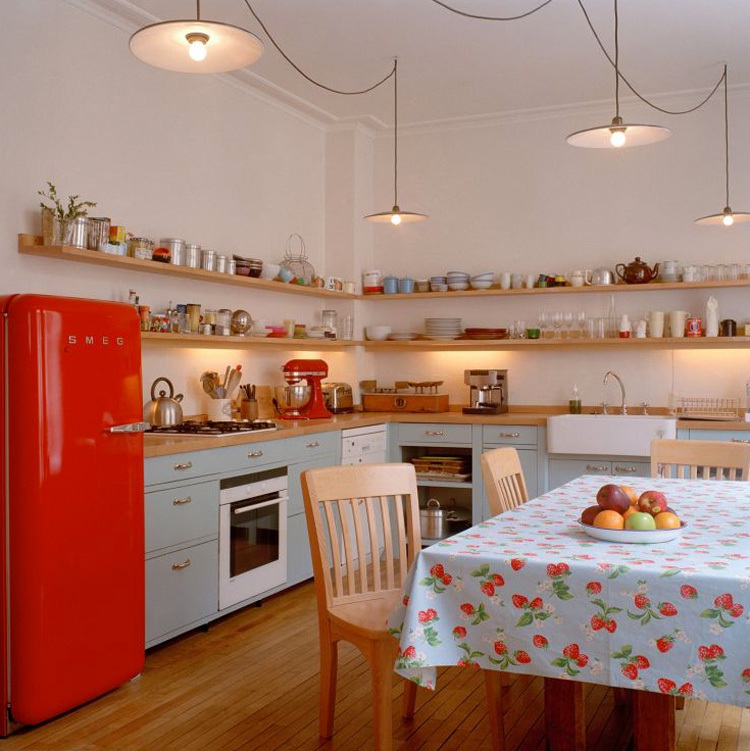 The ‘50s style Smeg Fab refrigerator (Fab28 to be precise), is the GPS for this distinctly Euro-look unfitted kitchen. Here, the refrigerator stands alone — not built in and completely portable. Yet the choice of a lipstick red appliance sets the style for this modern cottage kitchen, a look that has emigrated from Europe to the U.S.
Smeg is an Italian brand known throughout Europe for its retro look and pop colors. It’s not the largest refrigerator on the market and it doesn’t have many of the drawers, dispensers and whizzy things Americans expect. It’s a basic, modestly priced and appointed yet by virtue of the design it’s a showstopping kitchen feature. This kitchen also has a unique approach to the Miele dishwasher. Usually, the dishwasher hugs a sink, either on the left or the right side. Here, it’s at the apex of the work triangle — between the cooktop/oven and sink — and requires a pivot to the left, perhaps one step and leaning over to load it with the door open. While it’s most unusual to see a dishwasher with this placement, I can understand it: storage advantage. The farm sink has a small drawer and base cabinet to the left. In the corner, adjacent to the dishwasher, is one of those clever open lower cabinets that are a European signature and are rarely seen in American kitchens. If the dishwasher had been next to the sink the corner would be a problem. If you ask me to describe the style of this kitchen I wouldn’t say retro. I would say modern cottage. With no upper cabinets in the kitchen, and no back splash, it is open shelving that offers yards of storage for small everyday items. Task lighting hidden under the lower shelf provides good illumination for the cook. Swagged industrial pendants and the 1950s tablecloth nods to vintage oilcloth and aprons you see mostly in movies nowadays. The tablecloth also picks up the pale, blue-gray cabinet color that is so neutral it’s just there. Yet the pop of color from the fridge, and uncluttered freshness of a modern yet informal kitchen, show how flexible and smart a modest kitchen design can be. What a fabulous example of combining retro with modern- love that Frig! I always snort when I see this much open shelving in kitchens. Tell me, do YOU want to dust your dishes? Imagine keeping all the little doodads in this kitchen dust free. Open shelving in any kitchen should be limited to one, for items used often, such as water glasses set upside down. Snort away Michael. Those of us who have open shelves and actually use our dishes don’t need to dust them because they are washed regularly. When was the last time you took everything out of your kitchen cabinets? It can get pretty grimy inside those. We’ll need to disagree on the open shelving issue. Doubt you’d accept me saying you should be limited to one cabinet LOL.